The #1 most popular style of kitchen design in North America, according to 2017 Kitchen & Bath Design Trends Report conducted by the National Kitchen & Bath Association (NKBA), is Transitional-styled kitchens, followed by Contemporary at #2. The reason? Transitional style has universal appeal. If you don’t know what your style is, then Transitional may be perfect for you. 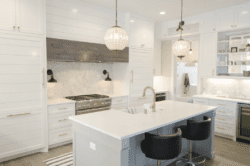 Transitional style came on the scene in the early ‘00s when the design pendulum began to swing away from the heavily ornamented, painted and glazed kitchens of the 80s and 90s and toward Euro-styled Modern. Homeowners did not take to the severe lines of Contemporary immediately; they needed to ease into it. Thus Transitional was born of a need for a balance between Traditional and Contemporary. The Transitional style was embraced right away, and it has morphed into a design style in its own right today. 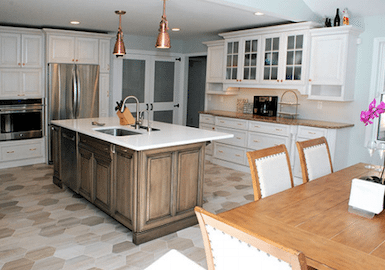 I’ve been designing Transitional kitchens since the beginning and have developed my own definition of Transitional based on what my customers have been requesting for the last 15 years. Transitional is warm and welcoming like Traditional, with clean lines like Contemporary. It’s calm like Contemporary, yet interesting like Traditional. Transitional takes in parts of both Traditional and Contemporary design and cleverly uses straight lines with a space for your eyes to rest, then punctuates those lines with just enough Traditional flair. What are some design elements that can be found in Transitional style kitchens? Cabinets with a streamlined look that goes near, but falls just short of, modern. Flat or recessed panel doors with straight lines in full overlay or flush inset style. No more beaded inset. Simple, rounded outside edge profiles and beveled or ogee profiles on the inside of the door, like Shaker or Brighton’s Cascade or Verona doors. Neutral color palettesin varying shades to create a balanced blend. My go-to colors are creams, whites, taupe, gray, espresso and chocolate. 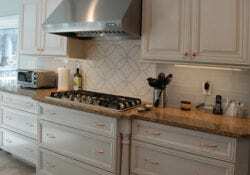 My kitchen designs tend to have more natural and earthy elements than strong colors. A mix of organic and manufactured materials. Wood, steel, glass, stone and/or marble all in the same space, working together to create a harmonious whole. Think of a stainless steel range hood against wood cabinets and marble backsplash. I like to mix a natural stone top with stainless appliances or pair wood cabinetry with sleek minimalist hardware. Lots of texture: Use everything from interesting tile surfaces to polished or rough stone to provide visual interest. Rustic elements, like stone, or “strong” woods, like Quarter Sawn White Oak, Walnut or woods with brushed finishes, mixed with the flat fronts of painted cabinets create great texture. Keep patterns simple.Part of what separates Transitional kitchens from Contemporary ones is that they allow for just a bit of decorative ornamentation. Moldings or corbels with smooth lines bridge the gap between fancy and plain. Minimal ornamentation. Legs, corbels, and moldings, if used at all, are kept simple. 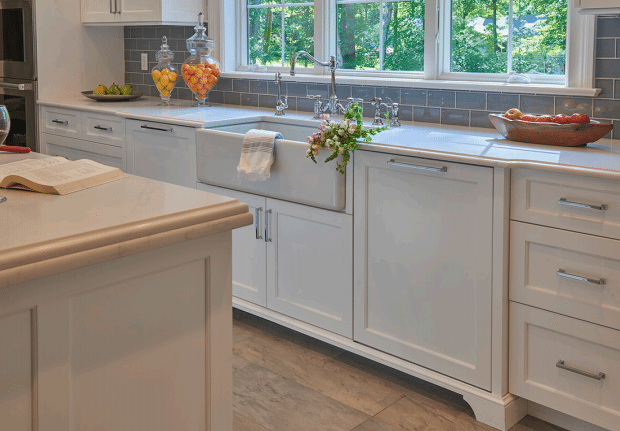 Prevo Cabinetry has a Shaker molding that works perfectly with Transitional styling. The island in my Transitional kitchen designs is a good place to bring in rustic wood or stronger grained wood, like Walnut. I like to create visual interest by using a different color paint from the perimeter on island cabinetry. Weathered or textured grains are part of Transitional style, and the island is a great place it use them. I use the backsplash to introduce texture. Large format or vertically stacked stone is Contemporary. Natural stone in a brick pattern or mosaic is Traditional. For a Transitional look, use an arabesque, fish scale or basket weave pattern. 3”x6” subway tiles are classic and never go out of style and work beautifully in Transitional. Whatever the pattern is for the backsplash, geometric shapes and patterns should be in a smaller scale for a Transitional design. Granite, marble, limestone and other natural-looking countertop materials with tones of stone are versatile enough to fit into either Traditional or Contemporary style. 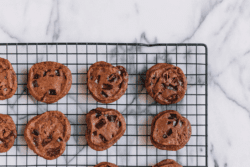 So they’re a perfect fit for Transitional kitchens. Honed or leathered finishes are popular with people who don’t like shiny surfaces. Fussy edge treatments are used with caution. 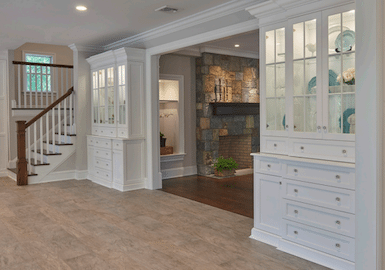 Flooring tends to blend into the background in Transitional spaces. It’s less about the material than about the color — natural woods or ceramic tiles, as long as they’re subtle. I like wood, most people ask for wood and it dominates. Tumbled stone is not a part of my Transitional designs, although geometric patterns with natural tones or octagonal designs fit nicely. Because Transitional-styled kitchens offer a great deal of flexibility, they’re the perfect choice for homeowners who don’t want to limit themselves to one single style or whose taste spans the two. 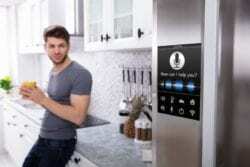 They can personalize as much as they like and know they have a kitchen that isn’t trendy and will hold its value. In this kitchen remodel for a busy working husband and wife, elements of my Transitional design philosophy are evident. The island is a different finish than the perimeter cabinets and features a brushed finish. I used a combination of organic and manufactured materials; I mixed a natural stone top with stainless appliances. The backsplash materials introduce texture – 3”x6” subway tiles and a smaller scale geometric pattern behind the cooktop. The owners of this home loved the freedom Transitional styling gave them when it came time to make cabinetry choices. Here, glass front hutches look Traditional, yet their simple flat-panel doors and drawers, minimal hardware and basic moldings say “Transitional.” A neutral colored floor completes the look. This remodeled kitchen in New Jersey has a classic subway tile backsplash and flat panel cabinets, time-honored treatments that have been around forever. The use of familiar design elements, a simple palette (white cabinets make everything right), and modern conveniences with strategically placed ornamentation make this a good representation of Transitional styling.